Hatters attacker Kazenga LuaLua has been labelled as ‘unplayable’ at times by team-mate Danny Hylton. The 28-year-old former Newcastle, Brighton and QPR forward joined the fray late on at the weekend to run rings around the Rochdale defence, setting up James Collins for the second goal with some dazzling skill. Although Hylton was off the pitch at that moment, having been replaced by Luke Berry, the striker said: “He’s on fire. Kaz is unplayable isn’t he? "He’s a joy to watch, sometimes you just stand there watching him on the pitch thinking he could just keep the ball for 90 minutes himself, no-one can get it off him. 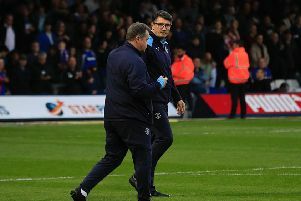 Town chief Mick Harford, who gave LuaLua his full league debut for the club in the 4-0 win over Peterborough shortly after taking over from Nathan Jones, added: “Kaz is brilliant. "He came on and he lit the place up with some of his skill and ability. "We see it every day in training and he’s got magic feet. "He danced past a couple, I thought it was going to be a penalty, thought he was going to get brought down, but he’s had the awareness to cut it back for Collo and it was a sublime finish."